In the field of project management, some of the best brains at a global level have been engaged in creating the architecture of the site as well as its contents. The Subject Matter Experts (SME's) represent a very wide community covering academics, business leaders and PM Professionals. Project Management (PM) is the art and science of converting Vision into Reality and Abstract into Concrete. PM addresses the issues of change and transition through out the project life cycle starting from need awareness, initiation, planning, implementation, control and close out in a most effective manner. Ultimate in modern project management e-Learning methodology The objective of IntroCIPM is to make the foundation of an individual strong in managing change. IntroCIPM covers the entire cycle of managing a change from the stage of conceptualization to realization. IntroCIPM provides a common business language across an enterprise across all the levels of management and executives. It is a must for both students and executives including managers and directors. There are 4 distinct interconnected phases in the site. Phase 1 Measures your PM Knowledge Quotient (PMKQ™) through 10 questions before the IntroCIPM Course. Phase 3 Prepares you for the Basic and Advanced Certificates in PM. 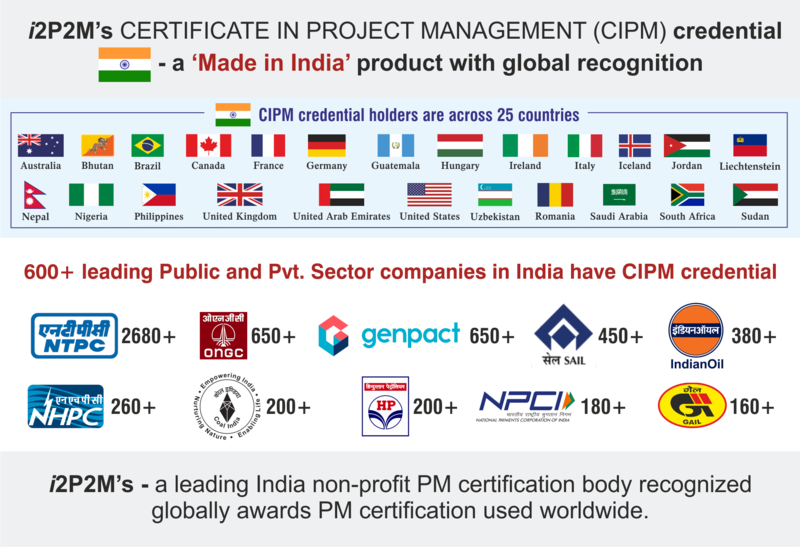 Phase 4 Measures your PM Knowledge Quotient (PMKQ™) through 10 questions after the IntroCIPM Course.